March 21, 1899 in Italy, in Milan, opened the World Cup by lifting weights. When on the eve of the competition sports commentators asked the Marquis Monticelli, founder and chief judge of the tournament, who, in his opinion, can succeed, he got off with a joke: "If I had participated in the competitions, I would not be worth while to call the winner." Marquis obviously cunning to representatives of the press. In the circle of Milanese weightlifters Monticelli was more candid: the winner of the championship he had hoped to see his fellow giant Skurov. Luigi Monticelli himself was a famous athlete, was distinguished by remarkable dexterity in exercises with weights. But is it could be compared with the colossus of Pavia, as lovingly styled Skurov! The latter was phenomenally strong, jokingly raised his massive round balls rods, threw up the stone and iron core. Skurov could on their backs carry large cask of wine thirty vederny, which barely cope four tavern servants. Journalists have compared the hero of Pavia with a pupil of Pythagoras - the legendary Milo of Croton, whom contemporaries considered the strongest man on earth. It tells the story, once the lecture started crumbling house in which there was a scientist. Attending the interview Milo pinned his arms loose columns, prevented the collapse and gave the teacher and his students leave the building. However, the Skurov was less confident of victory than his many admirers. FIFA really brought the strongest weightlifters in Europe, among which were the real heroes. Not long, for example, come from the famous Munich Redl, an appearance which could throw into confusion anyone. And indeed, biceps, Bavarian, circumference 50 cm, and talked about the rare relics of their owner. In the hands of Raddle lost weight rod and the Bulldogs, especially stamped iron bars, in a word - all the simple props weightlifter. In addition, the German champion was unusually tough, saying that his heart was a fighter. Yes, Redl was a formidable opponent in Munich, and is unlikely to withstand the criticism of forecasts Monticelli. But let's not get ahead, tell you all about it. One of the last many days after an uneasy path came to Milan representative of Russian Sergey Eliseev athletic sports. He arrived from St. Petersburg, where the day before won the right to be called first strong man Russia. Arrival in Milan Eliseev go unnoticed. His lean, lean figure somehow got lost among the bulky torso tall opponents. Modest by nature, shy of the crowded society, Elisha stayed on the sidelines, away from the sprightly journalists and curious onlookers. The program included five races exercises (weight raised one and two hands). The spectators surrounding the dense ring arena in which the platform was installed, a lively discussion by the participants. One after another went to the bar the strongest athletes of the world, comfortably straddle and abruptly threw up his hand to direct a heavy shell. "150 pounds, passed through the ranks, 160 ..." Acclaim greeted the Milanese success of your pet: a giant Skurov from the first approach, tore his right hand 170 pounds. Do not have time to escape the room Skurov participants, as a new burst of applause forced him to return to the hall. It turns out hero Raddle threw 175 pounds. What can I say, fear Skurov were grounded. Bury the podium, accompanied Italian look successful rival. He goes slowly, full of dignity, responding to the greeting the audience a slight bow of his balding head. Meanwhile, the platform goes Elisha. Broad-shouldered, with a flexible mill boy leans over to the bar. Dark-blond strand hanging over his forehead. Toes tight fit side by side on a cold neck shell, if the press in the metal. A moment of hesitation, then a considerable boost. The bar flies over shaggy head Eliseev. Here are rocking on the projectile straight arm athlete, viewers see how the wave go under the thin skin muscle, obedient fluctuations rods, and finally, she obeyed the athlete froze. Conquered by the power of man, the hall was silent. Unknown athlete from distant Russia repeated the result of the famous Bavarian. But, most surprising, the young man is not going away from the dais. Pale, stained cheeks, he explains that a bearded Marquis. Monticelli nods, gives instructions to his assistants. Those put on a new cargo bar. Now she weighs 180 pounds. A moment later a shell again soars into the air. Marquis Monticelli rises from his desk and applauds Russian strongman. He is very happy that nothing definite told the press. In this exercise, Elisha again raises more Redl, this time as much as 12 pounds after the third exercise Bavarian loses already a pud. And in the fourth exercise - squeezing with both hands, requiring a large force of arms and shoulder girdle, Redl raises the same Eliseev weight. The brave Bavarian somehow just wilted. He has not bowed to the audience. The only consolation is that Skurov also bypassed the Russian and did not rise above third place. Sergey Eliseev first Russian weightlifters won a gold medal champion. He was undoubtedly a skilled athlete of his time, although in some exercises with weights inferior to his comrades - and Peter George Gakkenshmidtu Krylov. These three heroes was a storm for many foreign guest artists, self-proclaimed appropriated the title of "most powerful people in the world." One of these athletes was the American Sampson. Champion of the New World arrived in St. Petersburg in the spring of 1899. The famous touring stopped in hotel "Europe" and the next day summoned the representatives of the press and the capital group of athletes led by Dr. Krajewski, founded in 1885, Russia's first weightlifting community. Mr. Sampson was well-fed man of medium height, with an energetic whiskered face. American courteously received guests, showed them the prize belt with solid gold jewelry, diamond medal with which he was rewarded for their sporting achievements. Then Sampson began to talk about themselves. "Of course you think the strongest man in the world of my fellow Kennedy, who had raised more than thirty pounds, - addressed the audience champion .- I lift three times ..."
Unfortunately, it can not currently possible to demonstrate its record-breaking exercises, as its weight ("Do not iron, and pure silver") is obtained from Customs. But something he still will. Sampson then rolled up his sleeves, put on his right hand on the biceps and two rings, chains made of a special style, and then tore them up muscle tension. Finally, out-of-print American began to bend and break the fifteen kopecks and twenty kopeks. He bent even a silver ruble, which, as you know, it was considered difficult. A few days later Sampson began his tour in the garden, "Olympia." Speeches visiting strongman have been furnished very theatrical. On a separate platform stood the famous silver weight champion. Sampson "played" them easily, without effort. The audience were charmed as every movement of the athlete. During regular performances at the arena Sampson suddenly got tight knit young man in a dress of an artisan. He strongly toward the dais with weights and asked for permission to repeat his championship experiences. American pale, pushed from his daredevil record weights, "No, I will let you tomorrow ..."
And tomorrow ... in the garden was neither Sampson nor his silver weights. "If the weights are heavy, then why not give them to check the weight, as do a little bit stronger athletes? - Wrote about the scandal in" Olympia "sports magazine" Tsiklist ".- The whole atmosphere of these ideas is that even a question in that Mr. Sampson is breaking this coin. Who knows, maybe it is just a clever trick! " At the time of Eliseev deserved popularity enjoyed circus athlete A. Moore, the Sign. He was a man of "steel back," rising on the shoulders of a ballroom pianist piano. 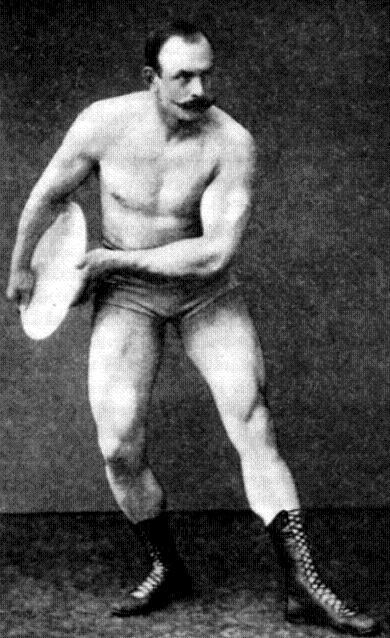 Znamensky exceeded in February 1897 the world record in clean and jerk with two hands: St. Petersburg athlete lifted a barbell weighing 389 pounds. In Moscow, has successfully performed another athlete nugget Sergey Dmitriev Morro, known later coach, who trained many famous weightlifters. With a weight of Morro Dmitriev worked fine, showing high technology. "Ozlites, take it boldly," was fond of saying, Sergei Ivanovich to his students, requiring them to courage, strong-willed head. "Do you know what an athlete? - It starts examiner weightlifters and certainly led to them saying the ancient philosopher Plato -" Athlete - a person who combines strength, health and stamina to stand the will, mind and heart. " Students from Morro should be called Alexander Dmitriev Bukharov. Winning the 1913 championship of Russia in the featherweight, this outstanding athlete retained the honorary title in 13 years. In the same pre-war he made his debut at National Arena wonderful heavyweight Ian Krause. Despite his youth (he was only 19 years old), he won first place. A young weightlifter was exceptionally nice complex, characterized by force and harshness. Krause belonged, in particular, the world record in clean and jerk with the left hand (96.4 kilograms). Results higher than the official world records showed, and other Russian athletes: from St. Petersburg, PA Herud zinsky, Kiev, and G. F. Grinenko Chikvaidze, Rigan A. Neiland, Chernigov athlete K. Pavlenko. But back to Sergei Eliseev. The victory of Russian athletes took a long sporting community in Europe. Many journalists have placed an article on the new champion, said his data: they are much inferior to the measurement and Skurov Redl. And the pictures Eliseev said that the champion did not outwardly give the impression of the athlete: the average growth, a modest weight-only 82 pounds. With this relatively low deadweight Ufa hero squeezed (but arbitrary way) devyatipudovuyu bar. Victory remarkable Russian weightlifter can be called a sporting feat. To understand the brilliance of this feat, it should be more thoroughly understand how to compete against weightlifters, who won on the platform.